David E. Sorensen was a General Authority of The Church of Jesus Christ of Latter-day Saints. He was sustained as a member of the Second Quorum of the Seventy on June 6, 1992, where he served until April 1, 1995, when he was sustained as a member of the First Quorum of the Seventy. He was designated emeritus General Authority on October 1, 2005. He also served in the Presidency of the Seventy from August 15, 1998, until August 15, 2005. 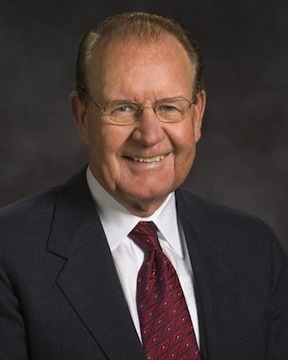 He served as president of the San Diego California Temple from 2005 to 2008. During his lifetime he also served as a bishop, stake president, and high counselor, and he presided over the Canada Halifax Mission. Sorensen was born on June 29, 1933, in Aurora, Utah. He spent much of his youth working on the family ranch. He was able to serve a full-time mission to the Central Atlantic States Mission prior to two years of service in the U. S. Army. He studied at Brigham Young University, Utah State University, and the University of Utah, but set his education aside to work to resolve debt on the family ranch. Business became his livelihood and he eventually became a partner in a company that specialized in long-term health care and psychiatric hospitals for people with developmental disabilities. He served for a time as vice-chairman of Nevada Community Bank in Las Vegas and also expanded the family ranch into an agribusiness. He and his wife, Verla, were the parents of seven children. He died on August 26, 2014, at his home in San Juan Capistrano, California. This page was last edited on 27 June 2016, at 17:10.